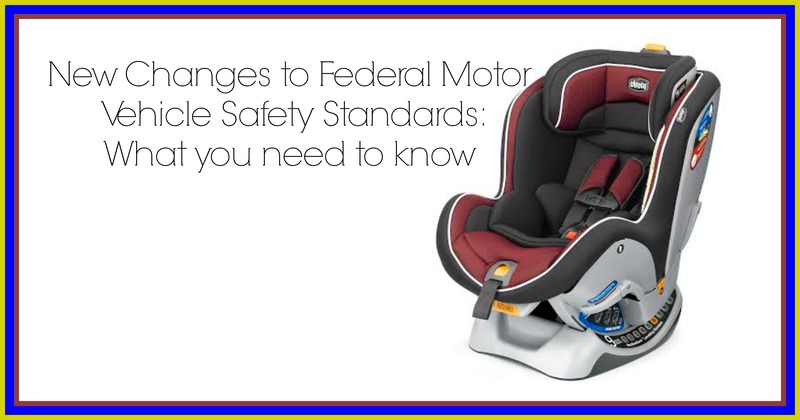 Did you know there are important new changes coming to Federal Motor Vehicle Safety Standards. There are new guidelines that went into effect on February 27,2014. Here’s a great article from Julie Prom the Chicco USA Safety Advocate & certified Child Passenger Safety Technician Instructor where she discusses what parents need to know and the requirements that car seat manufacturers must implement. Be informed, Your most precious cargo is at stake! By now, you’ve probably heard that new car seat guidelines will go into effect February 27, 2014. Here’s what parents need to know: these requirements are for car seat manufacturers. Parents and caregivers will not need to learn these requirements. Changes to Federal Motor Vehicle Safety Standard (FMVSS) 213 requirements are simply clarifying LATCH lower anchor limits and harness weight limits. For many years, there have been various weight limits for LATCH lower anchors buried in vehicle owner’s manuals and car seat manuals. The new requirement states that all car seat manufacturers must put this weight limit on the car seat label and in the instruction manual. This will make it easier for parents and caregivers to know when it is time to use the seat belt instead of the lower anchors to install the car seat. Is my car seat safe? Car seats made before February 27, 2014, will still be safe to use. However, parents and caregivers should check the vehicle owner’s manual and car seat manual or contact the manufacturer for specific instructions on LATCH installations. Many manufacturers will also have information on the FAQ pages of their websites. What do I need to know about harness weight limits? Changes to the harness weight limits involve crash testing with certain dummies. The only thing parents and caregivers will notice is that most convertible car seats (seats that can be used rear-facing and forward-facing) will now have a maximum weight limit of 65 pounds. This is because the new regulation requires car seat manufacturers who certify the car seats with harnesses over 65 pounds use the 10-year-old dummy in crash testing. The new FMVSS requirements will not have an effect on rear-facing only or infant-only car seats. These car seats and the children that use them are generally well below the new weight limit requirements. Convertible seats were never designed to be used by children up to 10 years old, let alone more than 10 years old. However, some Combination seats (car seats that can be used with a harness and then can be used later as a booster without the harness) will be tested with the 10-year-old dummy and continue to have varying weight limits. What about the new Side Impact Standard? The National Highway Traffic Safety Administration (NHTSA) has recently released a proposed side impact standard for car seats. It will be a least a few years before this standard will take effect. In the meantime, parents and caregivers can rest assured that the car seats currently on the market will protect their child in a crash. Most major car seat manufacturers already voluntarily test their products for some level of side impact protection. Today’s car seats do an excellent job of preventing injury and death to children. It is important to note that the biggest risk of injury in a side impact crash is intrusion from another vehicle or object. Therefore, the integrity and interior design of the vehicle is most important. Car seats with EPS or EPP foam do an excellent job of dispersing crash forces in both frontal and side impact crashes; thus reducing injury to the child. Additionally, the rear-facing position is the safest position. So, another way to keep your baby as safe as possible is to keep him or her rear-facing as long as possible, until at least age two. What should I look for when I purchase a convertible car seat? The best car seat is the one that fits the child, fits the vehicle, and is used correctly every time. When shopping, compare the ease of use features and then try installing the car seat in your vehicle before you buy. You may find several car seats that fit your vehicle, but only a few that are easy for you to install properly. Chicco has always been committed to providing easy-to-use car seats that meet or exceed FMVSS. In fact, Chicco’s NextFit Convertible Car Seat was developed with the new FMVSS requirements in mind. Additionally, Chicco car seats are voluntarily side impact tested and meet Chicco’s side impact standards. The NextFit label and user guide provide clear guidance for parents and caregivers on when to use the lower anchors of LATCH and when to use the seat belt. The NextFit design makes installing with either method very easy. Chicco’s NextFit even features SuperCinch, a one-hand LATCH tightener with force-multiplying technology, which ensures it’s installed tightly and securely. The shoulder belt lock-offs make installing the NextFit with any seat belt a breeze, and the RideRight bubble indicators and ReclineSure leveling system help to ensure the proper angle and accurate fit in a wide range of vehicles. 1. Never go against manufacturers’ weight limits. Always read and follow the car seat instruction manual and the vehicle owner’s manual. 2. Choose a car seat based on your child’s age and size. 3. Children should ride rear-facing until at least two years old, longer if possible. 4. Children should remain in a harnessed car seat until they are big enough and mature enough for a booster seat. 5. Always use the tether strap when using a harnessed, forward-facing car seat, whether it is installed with the lower anchors or the seat belt. I love how you not. Only provide. Your readers with fun. Articles and giveaways but also bring us such great information. My last baby was 9 years ago and I honestly feel like a ftm! Going to be a first timer here so this is excellent information. Thank you for the post! Chicco’s super cinch looks like a great feature! May have to have another look at my registry and change things up a little. Thank you! That’s really good information to have, and I would have never known had I not seen this post! So glad you posted about this! Thank you so much for posting this! I know that there are a lot of people who need to read this. Thanks for the heads up. Will go check my convertible and bucket to make sure it’s safe! better safe than sorry. Thank you for sharing this! I had heard that there were going to be changes, but I wasn’t sure what the changes would be. We are currently in several different types of car seats (*booster, convertible, and infant) so I want to make sure I am following the correct safety measures for each seat. Can definitely be a little overwhelming. Thanks for simplifying it! OMG, this all is so new to me! I mean my car is older than the baby’s car seat we are going to buy soon for the baby!!! So in this case I think the problem will be the car, not the car seat!!!! Very good to know! Thank you! I’m in the car repair business and I can’t tell you how many times I’ve had to correct a car seat for a customer. It’s scary what uninformed people do to their children, putting them at risk without even knowing! this is all really great info. I’m very careful to make sure my little boy is strapped in perfectly everytime and that anyone else who may strap him in knows how to correctly. I always check that he clicks into the base fully and do frequent checks on the current install. very soon we will be moving to a convertible seat and I’m glad to know if the new weight limit although I’m sure he’ll outgrow the seat in height before then.